Have you ever been tired of the same old same old? Like a never ending circle of boring for dinner? No? Well, awesome for you! I can’t say I share the same feeling. A weekly dinner for my family was always tacos made with ground beef and the same toppings for weeks on end. It was sickening to the point that one of my favorite foods, a taco, became stale. I’ve always had a want to make steak tacos. I would go to different Mexican restaurants and think, why haven’t I tried making these? Trying something new is always a process when you’re feeding the family. I started, like most, by hunting through Google and Pinterest. I was trying to find anything that would fill that void. FINALLY! I found a basic recipe to get my feet wet, and the whole family hated it. They hated it because I rushed and didn’t put any real effort into it. It was all done last minute with a “eh, what’s the worst that could happen?” attitude. So throughout the trials and tribulations I found complimenting flavors. Explored different ways to slice the meat. The correct time and temp for the meat. It does all start with the flavor though, doesn’t it? Nothing is like the nice taste of fresh oranges. While the steak is being soothed by notes of cilantro, and kissed by jalapeno heat. Isn’t that we are all looking for out of our food? Some feels? Speaking of steak, a skirt steak is the perfect cut of meat for carne asada. When shopping for the meat you want to find a piece that is pretty uniform in thickness and width. This helps to promote even cooking throughout the meat. I found that about a two pound skirt is a little more than enough for two adults and a four year old. I also slice the steak about a quarter inch thick then cube it. This helps break up the fatty pieces and make it so you don’t pull all the meat out with the first bite. The steak needs to marinate overnight, to allow for the flavors to become one with the steak. Here is what is in the marinade: oranges, limes, garlic, olive oil, white vinegar, one good sized jalapeno, fresh cilantro, and of course, salt and pepper. I find that juicing fresh oranges and limes gives it a better taste. You can use prepared orange juice and lime juice if need be. Since it’s a marinade and we aren’t on TV, perfect knife cuts aren’t dire. With the jalapeno, I rough chop it and leave the seeds in for that extra kick. Same goes for the cilantro. The garlic I usually take the easy route and use the minced in a jar. I have found using a gallon size, zip top storage bag to be the correct vessel for storage on this one. Since its a zip top, all the goodies can mingle and the air can be removed easily, plus they don’t leak in the fridge. When it comes to cooking, I use my gas grill because it’s right outside on my deck, so why not? I generally turn my hottest burner to high, along with the burner next to it. Once the grill nice and hot I lay the steak across it. Warning, it’s gonna flare up, and it’s going to char. I give up to five minutes on both sides depending on how bad the flare ups are. I shoot for a medium rare to medium to help keep the steak tender. Once removed, the steak needs to be covered with foil to keep its heat. Also allow it to rest for five minutes before slicing. We usually top our tacos with sour cream, guacamole, salsa, lettuce, cheese, and black olives. 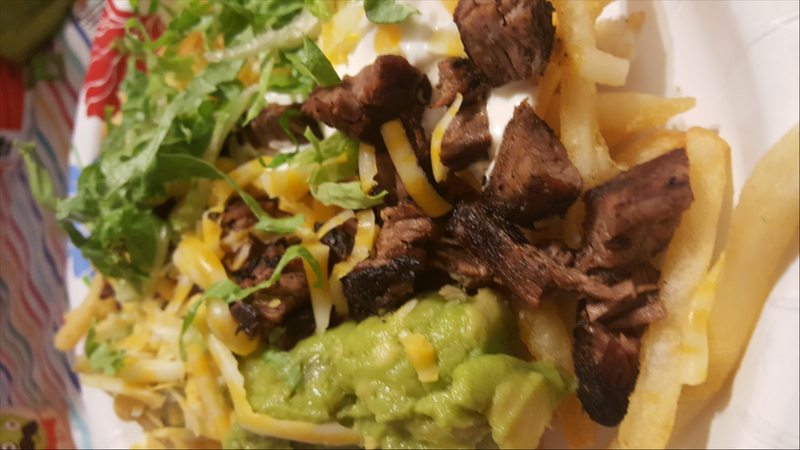 I have also made the carne asada fries! All the same toppings, but placed over fries with grated Colby Jack. In the fall, you can get chill cheese fries. Why not carne asada fries in the summer? ½ tsp Fresh cracked Pepper. Juice all citrus and place in gallon size, zip top, storage bag. Dice, chop, and mince remaining herbs and veggies, and place it in the bag. Place salt, pepper, white vinegar, and olive oil into bag. 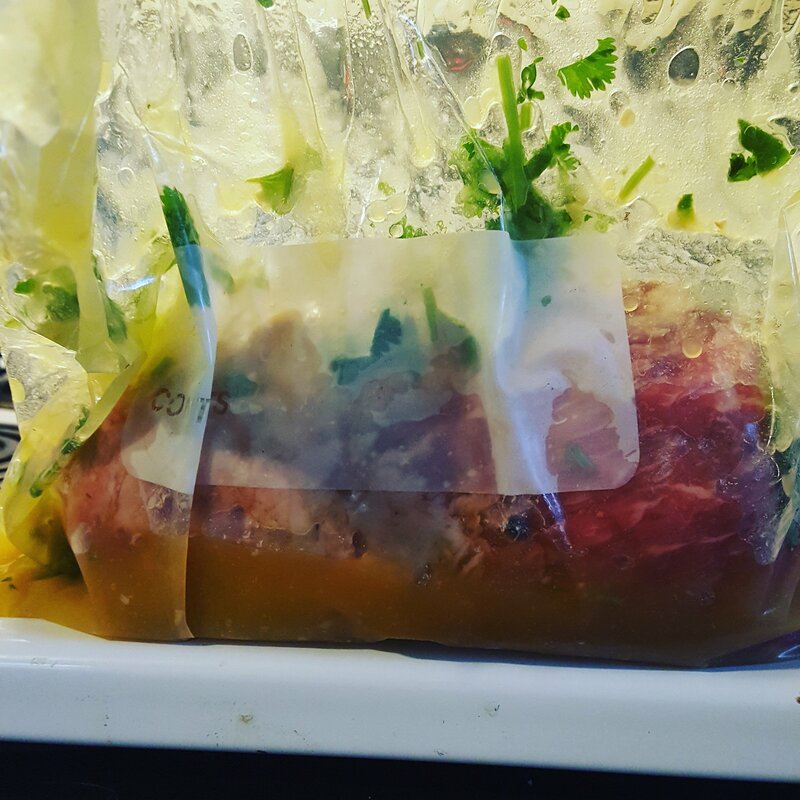 Place meat in bag and cover with marinade. Squeeze out excess air and seal. Place it the fridge for at least two hours, up to overnight. Heat hottest burner to high and place steak over it for three to five minutes on either side for medium rare. Watch for flare ups. If using charcoal, heat coals to glowing and ash white. Place steak on the coals for 90 seconds per side. Cover with foil and rest for five minutes before slicing. I slice it ¼ inch thick, and then cube it into bite size pieces.